The adoption of mobile and cloud technologies is driving massive change in organizations around the world. These new technologies enable organizations to streamline business processes, lower costs, and help employees work productively wherever they are. However, securing mobile apps and cloud services requires more than traditional, PC-based security approaches that aren’t designed for the mobile-cloud world. 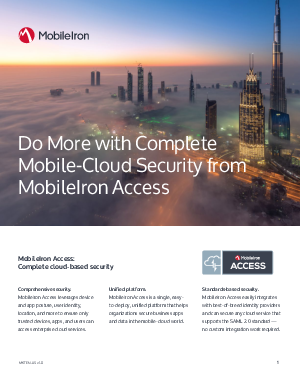 Learn more about MobileIron Access at mobileiron.com/access.